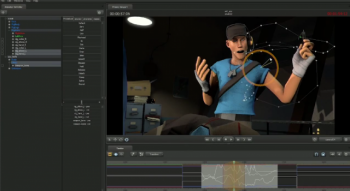 Valve's home-grown animation software launches with an extra "Meet the Team" video. Though it premiered just a couple weeks ago, Valve's Source Filmmaker has already helped create tons of Team Fortress 2 fan-made videos. Everything from a hat-themed spoof of The Little Mermaid's "Part of Your World" to Monty Python's "Dead Parrot" sketch featuring a Demoman and Soldier has come out of the closed beta. The testing has gone so well, in fact, that Valve is now opening the beta to anyone with a copy of Steam. With the open beta comes a Steam Workshop-esque page on Valve's website, which allows community members to watch, rate, and discuss any video made and shared in the new application. Valve called out a few of its personal favorites last week on its blog, including an extensive 2Fort-based action sequence and a "Meet the Heavy" spoof with approximately 250% more hats. Since many of the fan videos so far are riffs on Valve's "Meet the Heavy" short, which was included with Source Filmmaker to give would-be animators a polished video to poke at, Valve is also releasing its "Meet the Engineer" short with the open beta. That doesn't mean there's no variety already though - one enterprising filmmaker has already created a Half Life 2: Episode 3 spoof with no Team Fortress 2 characters in sight.